Bird watching is a fascinating hobby. Taking a few minutes to plan ahead will make the best of your experience. The most important things to consider are comfort, safety, and mobility. Following birds means walking, so shoes that are comfortable and protect your feet are a must. You’ll end up in a variety of terrain as well, from grassy areas to shrubs. Long pants and a long sleeved shirt made from a durable fabric such as denim will help protect you from thorns and branches. Skin cancer is always a concern, so protect your head from the sun with a good hat and always wear sunscreen. Keep in mind that many birds eat insects, and following them to their food source may expose you to bugs who consider you dinner. A good insect repellent is essential to enjoying your experience. A small first aid kit is also a good idea. Because birds are so mobile, make sure that everything you take is easy to pick up and carry. There are many small, insulated lunch bags on the market that fit neatly into a backpack or over our shoulder. A sturdy bag that fits comfortably over your shoulder may be lighter and easier to carry. You may also want to consider cargo pants or a vest with spacious pockets so there is nothing to set down or pick up. 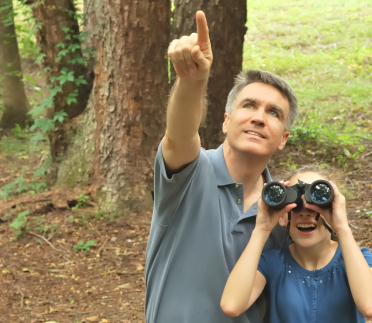 In addition to safety, comfort and mobility, another vital consideration for a successful bird watching experience is a pair of quality binoculars that allow you to observe color and feather details from a reasonable distance without frightening away your viewing quarry. A light weight tripod and binocular accessories such as EyeShields from Field Optics Research will ensure that all of your preparations for an enjoyable and fascinating bird watching adventure have not been in vain.